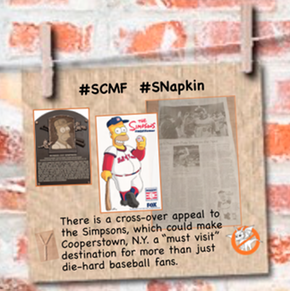 Did you know that Homer Simpson got inducted into National Baseball Hall of Fame in a ceremony at Cooperstown, New York. over the weekend? Yes, that Homer (though if you check out this link, you’ll see other baseball Homers). Apparently, it was all part of a Fox promotion to celebrate the 25th anniversary of one of “The Simpsons” most enduring episodes — “Homer at the Bat,” which first aired on Feb. 20, 1992. 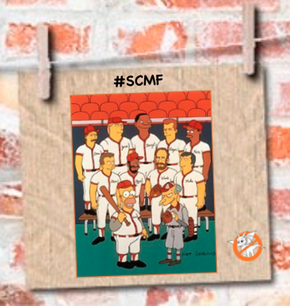 It featured the voices of nine major league stars playing themselves as ringers for the Springfield Nuclear Power Plant softball team. And who were those magnificent major leaguers? Don Mattingly, Steve Sax, Ozzie Smith, Wade Boggs, Jose Canseco, Ken Griffey Jr., Darryl Strawberry, Mike Scioscia and Roger Clemens. It almost was eleven, but Carlton Fisk and Ryne Sandberg rejected a formal invitation to participate. AWSI, this helps Cooperstown move up on the list of “must visit” sites more than just the die-hard baseball fan as “The Simpsons” has tremendous cross-over appeal. Definitely a plus. The publicity helps the Fox network draw more viewers as they head into the summer. 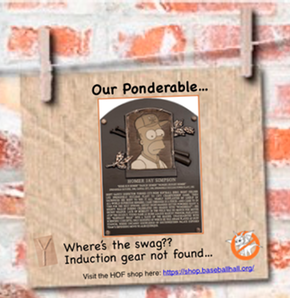 Our ponderable… So why isn’t there any Homer swag?